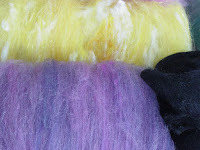 Froggy's Fiber Followings: More Batty Goodness! Here are the batts I promised a couple of days ago. 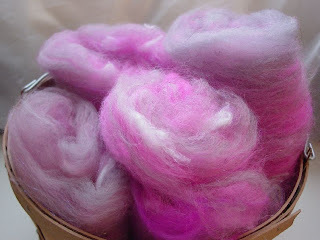 Since then I have begun carding a multicolor blended batt. It has no glitz in it but thats okay. What I do know is that it is the perfect color combo to go with Mystic Dreams. I wasn't sure what to make with that yarn but I know it wanted to be something sorta hip and funky. Unfortunately I am not the hip and funky type. Plus it was knit a scarf or crochet a shawl. A very tiny shawl at that. So after talking to my spinning group I decided to make Mystic Dreams into a crocheted handbag. We got to talking about it and figured 132 yards of bulky isnt enough. So I was going to make some black three ply for the bottom and the handle. Instead I have to figure out how to incorporate this blend. Do I try to create a cabled yarn with 3 black and 1 multicolored strand? Do I do a black navajo plied yarn for the bottom? I don't know. So many options! I do however know that these batts are lovely. On the left is "Technicolor Yawn" and "Overload in Red." On the right is "Overload in Yellow" and "Mixed Berry." 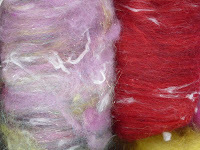 Mixed Berry is the one that is going to be spun and paired with Mystic Dreams. I'm having a lot of fun with the batts as always, though sometimes I wish they werent so time intensive. You really can not multi-task and card at the same time. I did list "Rebirth" (below) in my Etsy store as separate batts and will probably list the two "Overload" batts as well. I may even make more to add to the listings later. On a happy note. I did make a sale today. Yay Froggy! I guess that is my prerequisite "one-per-month" sale. I'm super thrilled about it though. It's still a really good feeling. I wasn't aware of any of these yarn techniques until Etsy, you guys are rockin. Congartulations on the sale and wishes for many more! those colors look so pretty, like cotton candy!